I am an independent video cameraman, video editor, audio & media production specialist. Over the last 10 years I have worked on many multimedia projects with clients, bands such as Dr Thirsty and The Tangent, producing DVDs and audio CDs through to corporate clients, such as Hields Aviation, producing their promotional DVD and specialising in aerial video with my work as camera operator in G-OTVI being shown on all the main UK TV channels, BBC, ITV, CH4, and CH5. I produced video output using Adobe Premiere Pro, audio mixing with Cubase and audio CD mastering with Steinberg Wavelab. Click the showreel buttons at the top to view my showreel videos. Click the credits button to view a list of TV programs featuring my aerial video. My background is electronics engineering since my teens then becoming involved in video and media production. In the 1980s I worked at Systime Computers and I'm still working with computers to date. I was an electronics instructor in the mid 1980s. In the 1990s I worked for Leeds College of Technology (formerly Kitson College) as a senior electronics technician designing & maintaining equipment. I also designed electronic construction projects for the monthly magazine Electronics Today International. From 2001 to 2007 I designed & produced the live sound & light show for Harrogate pop/rock band Dr Thirsty and provided similar events for other local bands Beauty & The Beasts and Tequila Sheila. In between working I gained my Private Pilot's Licence flying Robinson R22 and R44 helicopters, flying all around the UK. Lastly working as a media technical manager at Leeds Metropolitan University working closely with media production of all types including video streaming, audio & DVD production, events production as well as managing a busy and vibrant media services department on the Headingley Campus, whilst also finding time for independent media projects. Now retired from full time employment but still keen & active with computers, electronics, video production, aerial video using a DJI Phantom 3A and Mavic 2 Zoom, photography, Hi-Fi and 4K Home Cinema, flight simulation, racing simulation, online gaming, and riding my mountain ebike. 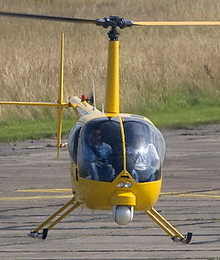 G-OTVI is no longer owned or operated by Hields Aviation and Paul has retired from helicopter aerial filming. I now recommend FlyingTV and Arena Aviation for HD aerial video.